Step 2: Once the issue had been identified, Dr Danylak removed the slowly growing fibroma using Waterlase. Laser Waterlase is a completely safe, very gentle alternative to many of the traditionally used dental tools that are available. The tool works by using a laser and a spray of water, rather than traditional use of a scalpel. With our focus on patient care and comfort, this is a tool commonly used at dhealth. Step 3: As with all types of growths, we sent a sample off for pathology analysis. While fibromas are usually benign, we always like to make sure we’ve triple-checked everything here at dhealth. Step 4: We scheduled a follow-up appointment for Clara two weeks after removing the lump. This follow-up allowed us to check that Clara’s mouth was healing well, that her overall dental health had not been affected, and to ensure that the growth was indeed benign. 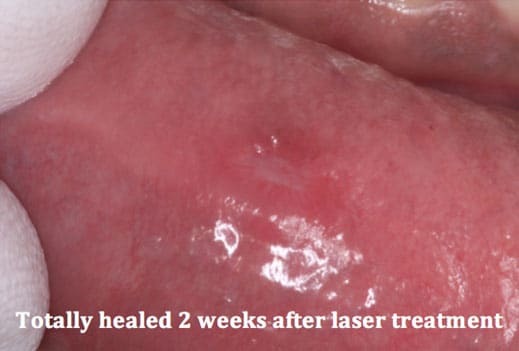 The photos taken 2 weeks later show no scarring and a totally healed lip. Step 5:The team at dhealth will continue to monitor for any further growth at Clara’s regular, ongoing six-monthly check-ups. Something that had been worrying Clara for months, ended up being a problem that the expert team at dhealth Dentistry in Camberwell could fix in just one appointment, with no pain and no needles required. What Are Fibromas and Papillomas? Put simply, fibroma and papilloma are two quite commonly found, benign tumours that only occur inside the mouth. Fibroma are the most common, and are caused by quite simple actions, such as sucking or biting on any part of the mouth, including the check, lips or tongue. A fibroma usually looks a bit like a mushroom, but has quite a smooth, bright pink surface. A papilloma, on the other hand, will appear of its own accord (without any irritation needing to occur first), and are usually caused by some kind of virus, almost like a wart. They are similarly mushroom-shaped, but instead of being pink and smooth, they are usually white and have a bumpy, irregular surface.